I have been in the trenches for the past year, working tirelessly as a Yamhill County citizen to raise awareness of abuses within the foster care system administered by DHS. I have found a wonderful friend in County Commissioner Mary Starrett. She has helped me many times in arranging meetings, getting issues surrounding foster care and DHS addressed with the appropriate people and championing minorities who don’t have a voice. What has really stood out for me is her tireless work with the foster care youth. The mentorship and assistance she has provided in that area cannot be overstated. It’s something more people should be involved in. I don’t know what I’d do without Commissioner Starrett helping me. We need more change within our government agencies, holding their feet to the fire and bringing up true concerns from constituents in Yamhill County so they can be addressed. Thank you for your support of Commissioner Starrett. I hope everyone votes for her in the May primary. We have many choices to represent our county as a commissioner this coming election. However, one candidate stands out to me as a commissioner to represent us — Mary Starrett. Mary is not a follower; she is a leader who listens to the voices within this county. She is educated and experienced in so many areas, and driven by a passion for the people. She is a great communicator, yet has the desire and ability to listen closely to the issues and concerns within our county. This job requires visibility, and Mary is everywhere. It requires time, and Mary is committed to investing the time and effort needed to be successful. The area of Human and Family Resources is one of the most complex responsibilities of our county government, and Mary has brought the experience and knowledge to lead in this area. I have worked with her on youth outreach, homelessness and human and family services — all complex issues. I find that Mary is always looking for a better way, a more effective and efficient way, to bring solutions to the families and individuals within our communities. She is a fiscal conservative who accepts accountability for the dollars we spend in a day and age when many governmental entities do not exercise that discipline. I appreciate her approach to government leadership. She shows passion, common sense and a high level of commitment to those she serves. Please vote with me for another four years of Mary Starrett as our county commissioner. Yamhill County Commissioners on Tuesday discussed how best to dispose of property the county obtains by foreclosing for back taxes owed. Parcels valued above a certain amount are required to be sold at auction, but the commissioners are working on a policy for handling unusual cases. The county currently has a number of parcels on its hands, and is looking at a variety of options for dealing with them. Most are either sold at public auction, or, in the cases of small, low-value pieces, offered for sale to adjoining property owners. However, for a few parcels, the county is considering some way to make them available for uses such as affordable housing, or a nonprofit youth shelter. County Counsel Christian Boenisch noted there might also be cases where a parcel would be particularly well-suited for use as a county park or greenspace. Commissioners also spent time discussing the fairness of the foreclosure process. They were frustrated to hear from Boenisch that he knows of no way for the county to reimburse the former property owners for any sale proceeds in excess of the taxes owed. Commissioner Mary Starrett said she wants the county to be able to take possession of the taxes it is owed from the proceeds, plus any administrative fees to cover staff time, and then return the remainder to the previous owner. Commissioner Rick Olson said taxes constitute only a small percent of the total value of most properties, and he agreed the rest ought to be returned. Commissioner Stan Primozich also agreed, but Boenisch explained the way the state law is written, he can’t determine a way to do that. The exception, Boenisch said, is when a former owner still lives in a foreclosed house, in which case the county can “explore selling the house back to them.” He said the county is currently working on exactly such a premise in one case. However, he said, he can “do a little more digging” to see if there are any other ways to approach the problem. Primozich urged him to do so. “I don’t mind Yamhill County being the poster county to others for doing the right thing,” Primozich said. Primozich did note that the entire foreclosure process takes several years, with multiple notices sent out, and an owner can simply pay one year of back taxes, to delay the process further, allowing more time to supply the remainder of the money. But in some cases, particularly where an owner may be elderly or struggling with mental health problems, the process may seem overwhelming. He and Olson suggested the county could institute workshops to help property owners through the process. Boenisch noted former County Assessor Scott Maytubby typically went out of his way to try to help owners avoid foreclosure. Maytubby’s term ended last January, and he was replaced by newly-elected assessor Derrick Wharff. Boenisch said he would inquire about Wharff’s policies on the matter. Some, typically small, odd-shaped, parcels enter into county ownership because they have somehow not wound up within the boundary lines of any adjoining property and so no one has paid taxes on them. In those cases, the county may offer them for sale to the adjacent owners. Boenisch also reviewed the mechanism by which the county might work with cities to sell them properties suitable affordable housing. He said the contract would “need to make it clear that [the property] is not being transferred to cities at a low rate so they can turn around and sell it and make a profit.” One possibility, he said, is a clause requiring if the property isn’t developed as intended within a specified time, it would revert to the county. Commissioners also held an executive session to review the disposition of specific parcels. Wow, I just learned something I didn't know before. I think it's pretty outrageous that if someone owes, for example, $10,000 in property tax and the county sells the property for $200,000...the county keeps the entire amount and not just the taxes owed plus costs. They say there is a first time for everything and it's rare that I agree with Mary Starrett, but I do on this one. I agree. I can count on one hand the amount of times I agree with Starrett, but this seems like a ciitizen rip off at the hands of the government. A government who already receives massive amounts of tax dollars. Last Friday’s News-Register contained stories about two locally elected officials confronted with conflicts of interest. One behaved impeccably, avoiding not only the exercise of undue influence, but also the appearance. The other, not so much. There’s a lesson here, as the mere appearance of official impropriety is wreaking irreparable harm on our treasured democracy. Confidence in elected leaders is at a low ebb, because of often well-founded suspicions they are taking unfair advantage. In the first case, seven residents of rural, one-lane Smith Road, on Parrett Mountain, petitioned the county for permission to gate it. They said outsiders were using it as a casual shortcut, creating hazardous situations, and they were prepared to foot the bill. There are about a half-dozen houses on the narrow rural byway, and Commissioner Mary Starrett occupies one with her husband, Ron. She’s not a petitioner, but he is. There’s no evidence Starrett has expressed a view on the road-gating, though. And when it came under initial discussion Thursday, she not only recused herself, she left the hearing room. Four residents made their case, but Starrett’s husband was not among them. It was his legal right, but he took a pass. If he did so for appearances’ sake, we applaud him. We consider his the correct call. In the second case, a resident of Southwest McMinnville’s Edmunston Street sought city permission to appropriate right of way stretching along one side of his lot, reasoning it would never be put to public use. He sought first to secure support from two-thirds of affected neighbors, but they united in opposition. He next entered into city-sanctioned mediation with them, to no avail. Finally, he petitioned the city council to grant him the strip regardless of his neighbors’ objections, losing on a 3-2 vote. Unlike Starrett, City Councilor Kevin Jeffries plunged into the fray at the outset, even though he is married to the applicant’s niece. He accompanied the applicant to his initial meeting with neighbors, introducing himself as an elected councilor. According to one disgruntled neighbor, Jeffries tried to strong-arm them into acquiescing, warning approval would be a slam dunk if it went to the council. At Tuesday’s session, the applicant used the public comment portion to state his case, even though it was listed on the agenda as a formal discussion item. Jeffries not only remained in his council seat, but went so far as to assist the applicant in pressing his cause. When it came time for formal deliberations, he moved into the audience, giving him a potentially intimidating first-hand view of the action. Not so many months ago, Jeffries led the charge in the ouster of Martha Meeker as city manager, then applied for the job himself. That seemed so tone deaf, it earned him rebukes from both this newspaper and one of his colleagues. The problem is, appearances matter, underlying intentions notwithstanding. The guiding rule should be, neither private gain from public office nor the appearance thereof. The Yamhill County commissioners voted 2-1 Thursday to buy nearly 12 miles of railroad right of way, envisioned as a future hiking and biking trail, from the Union Pacific Railroad. The section lies between Gun Club Road and Gaston. Commissioner Mary Starrett, a firm opponent of the Yamhelas Westsider Trail project, cast the dissenting vote. The parties have agreed the actual value of the property exceeds $1.4 million, allowing the railroad to treat the excess as a charitable contribution. Only one private citizen addressed the issue, longstanding trail foe Bryan Schmidt, who farms on both sides of the rail easement. He asked commissioners to delay the purchase until the county completes an agricultural impact study. He also noted that one of the grants being used to fund the acquisition is earmarked for a bike path. Commissioner Rick Olson said both he and Starrett had pledged to “insist on a feasibility study that met the requirements of ORS, and that ... no construction or design would be done until that was approved.” But he said he considers purchase of the railway corridor as a separate issue that can properly be addressed independently. “I think it’s imperative that when we have this kind of opportunity, that we actually buy the corridor, no matter what the corridor will be used for,” Olson said. He acknowledged to Schmidt that the grant is designed to facilitate biking. The county’s conceptual plan calls for a path that can be used by walkers, joggers, bicyclists and horseback riders. Starrett re-stated her concerns, for the record. She noted the county had decided to proceed without title insurance, after being advised this type of purchase does not lend itself to title guarantees. “I think that should be a red flag. It should tell us that without title insurance, to make a $1.4 million purchase is foolish,” she said. Chair Stan Primozich, a longstanding trail supporter, has pledged the county will work with farmers to mitigate impacts. However, he refrained from commenting Thursday, merely cast his vote in favor. In the course of approving a $136.5 million budget for fiscal 2017-18, the six-member Yamhill County Budget Committee approved a recommendation from its three lay members to grant its three elected members a 5 percent raise. Commissioners Mary Starrett and Rick Olson said they would be forgoing their raises, but Commissioner Stan Primozich followed through on an announcement made this time last year that he would be accepting his. As a group, the commissioners last accepted a raise in 2012, pushing their annual pay to $73,077. That ranks above the prevailing pay level in Polk County, but below those of Benton, Columbia, Josephine, Linn and Marion counties, according to County Administrator Laura Tschabold. The commissioners are also eligible for Public Employment Retirement System benefits, but have each opted to accept an extra 10 percent pay stipend instead, which is more advantageous to the county. Starrett argued for rejection of the raise outright. That would have prevented Primozich, who ran an insurance and investment agency before his election to the county post, from making his own decision. He also cited two decades of unpaid service on the McMinnville School Board. He said he believes his record of public service speaks for itself. “I would hate to see us get to a point where only people who can afford to run for office do it,” Primozich told his colleagues. He said he’s spent the last 2 1/2 years putting in extremely long hours on behalf of his constituents, and thinks he’s earned a raise. Starrett said she also puts in long hours, including night and weekend hours,and acknowledged that her colleagues do the same. But she said commissioners work for the public good; they should not be motivated by money. But in the end, Primozich prevailed. While Olson wasn’t willing to accept a raise this year, his first with the county, he said he wanted to get it on the books so it would be available to a successor. Meeting as the County Compensation Committee, the budget panel’s lay members also recommended increases for the county’s elected sheriff, clerk, assessor and treasurer. The district attorney’s salary is funded mostly by the state, which makes periodic adjustments, although the county also provides a stipend. The budget adopted by the committee is down $3.1 million from this year’s $139.7 million. It requires a property tax of $2.57 per $1,000 of assessed valuation. It will come before commissioners for a public hearing and final approval in late June. Tschabold told members of the committee, who spent two full days reviewing the budget with department heads before Wednesday’s vote, that several county departments are substantially funded by the state. She said state funding remains uncertain, so the heads of those departments took a cautious approach. She said the commissioners may be able to make some adjustments, based on state action, when the budget comes up for final approval. In the meantime, the committee plans to conduct a follow-up work session from 10:30 a.m. to 12:30 p.m. Wednesday, May 17, in commission chambers at 434 N.E. Evans St. to discuss future policy issues. The committee approved payment of dues to local chambers of commerce around the county, which it views as an economic development contribution. It also authorized several grants to various organizations. It declined a request from the county Fair Board for an extra $28,000 of video lottery money, however. The fair board wanted to use the money to fund a six month overlap between retiring Fair Manager Al Westoff and his successor, yet to be named. The committee said they believe an experienced and competent event manager would not need six months of mentorship, so declined to allocate the money. $10,000 to Habitat for Humanity for its Veterans Build project, which is being chaired by Primozich, a veteran himself. 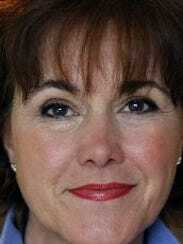 Habitat Director Mary Stern, a former three-term county commissioner, sought $45,000. $10,000 to the county’s Veterans’ Services Department, in lieu of additional money to Habitat for Humanity, which met with approval from both Primozich and Olson, also a veteran. $15,000 to Homeward Bound Pets to help fund a new low-cost spay and neuter clinic it has planned. $10,000 to the McMinnville Area Chamber of Commerce to support its annual Fourth of July fireworks display. $5,000 to the Nerd Herd Robotics Team to support efforts to become an independent organization and begin recruiting members on a countywide basis. $150,000 to the Union Gospel Rescue Mission to help fund construction of its new men’s shelter. The organization requested $200,000. $5,000 to help cover the cost of a seasonal assistant for the county watermaster. $4,000 for Court-Appointed Special Advocates, which asked the county to increase its normal $3,000 allocation to cover a cut in state funding. $12,000 to Your Community Mediators, which sought an increase to $27,725 to help cover truancy mediations. The committee felt that should be a school responsibility. The committee turned down a $60,000 request from the Willamette Valley Cancer Foundation to fund adult tobacco cessation classes, but encouraged county Health and Human Services Director Silas Halloran-Steiner to work with the foundation and report back next year. Marcus Larson / News-RegisterThe Atticus Hotel is under construction at Fourth and Ford streets downtown. 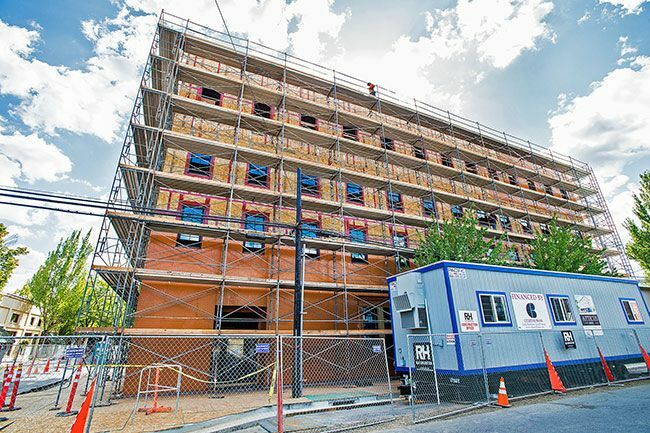 The Yamhill County commissioners agreed Thursday to award $100,000 in economic development funds to Erin Stephenson and Brian Shea, co-owners of Third Street Flats, to assist them with their Atticus Hotel project in downtown McMinnville. The vote was 2-1, with Stan Primozich and Rick Olson voting in favor, Mary Starrett against. Starrett praised the project, designed to expand high-end tourism accommodations for Wine Country visitors by giving the south end of the county a counterpart to Newberg’s Allison Inn & Spa. However, the county is planning to hire an economic development director and form a committee to oversee the grant program, and she argued that it should wait until the director and committee are in place before proceeding. Commissioners heard presentations Tuesday from two applicants, Stephenson and Paul Peterson of Power Gen Volta. Peterson said his company manufactures generators capable of running on bio-gases, including methane from dairy operations and landfills. He said it was seeking $250,000 to build a pilot plant in McMinnville. The commissioners said his application lacked some elements needed to get a full picture, including a business plan and a detailed breakdown of owners and sponsors. They promised him a second look if he would provide the additional detail they sought. The commissioners split on Stephenson’s request for $100,000 in aid on several grounds. Primozich said it makes little sense to him to give applicants less than they say they need to complete their projects. “If they needed less, they would ask for less,” he said when the county first considered the projects Tuesday. He amplified that Thursday by saying the county has provided the full amount requested on several previous occasions. Starrett also argued that some of the county’s grant money should be set aside for the West Valley. “You know, we’ve got several cities in the county, two of them in the West Valley, that are dying,” she said. No applications were submitted from the West Valley, or other parts of the county, for that matter. Starrett theorized that was because they weren’t aware of the program. He noted McMinnville-based businesses employ residents of the county’s smaller cities, and that creating more jobs in McMinnville thus benefits the rest of the county. And Olson, who served as mayor of McMinnville before winning election to the board of commissioners, seconded that. She said they plan to develop those facilities, along with restrooms, staff offices and a break room, on the ground floor of the Odd Fellows Lodge next door. She said that’s because renovation of an existing structure to serve that need would be much less expensive than building from scratch. But she said that means they can’t use any of the Small Business Administration loan provided for construction of the hotel building. She said that’s why they turned to the county’s Strategic Investment Grant program. The $6 million, four-story hotel is being built by Odd Fellows LLC, a partnership of Stephenson, Shea, Stephenson’s father Rob and News-Register Publisher Jeb Bladine. It also owns the adjacent lodge, one of the buildings housing Third Street Flats units. Stephenson and Shea are the sole owners of the Third Street Flats business, through their Live McMinnville LLC partnership, and will also be the sole owners of the allied hotel business. They have lease agreements in place for use of the lodge and hotel facilities. Stephenson told commissioners they are focusing on making sure the hotel benefits the entire county, by sourcing equipment, labor, materials and supplies locally insofar as feasible. “We believe deeply in a ‘shop local’ approach, and are working with local companies to source everything from coffee, tea and wine to art, furnishings and even our mattresses, which are being manufactured in Newberg,” Stephenson told the News-Register. She said she expects the hotel to create 65 to 75 new jobs directly and said it may also create additional jobs indirectly by requiring companies with which it does business to add staff to accommodate the additional trade. For example, she said, when Live McMinnville began leasing the Odd Fellows Lodge, thus expanding its Third Streets Flat operation to a second location, the cleaning company it uses had to hire six additional employees. The hotel plans to sub-lease space for a restaurant to noted Portland chef John Gorham, who has pledged to source locally as much as possible as well. Stephenson told commissioners the hotel itself will create about 25 jobs, consisting of five managers, six concierges, six valets, six housekeepers and two maintenance workers. She said the restaurant is expected to generate another 40 to 50 jobs. Yamhill County Commissioner Mary Starrett has announced plans to seek a second term. If successful, she said, she will continue opposing any spending she considers wasteful of taxpayer money. Starrett said her first term has been characterized by a series of “thumbs down” responses to requests for more spending. She has focused particular opposition on the county’s purchase of railroad right-of-way for the proposed Yamhelas Westsider Trail. “We seem to have lost sight of who ultimately picks up the tab for all this stuff,” she said. Starrett supports boosting federal timber cutting and revenue. She has also pushed for a new countywide Emergency Notification System, to be implemented later this year. Starrett serves on the McMinnville Homelessness Subcommittee, Homeward Bound Pets Steering Committee, YCAP Board of Directors, Northwest Senior and Disability Services Board and the Oregon State Distracted Driving Task Force. Yamhill County Commissioners on Thursday upheld an appeal by Atticus Winery, denying approval of an application for a new solar farm along Highway 47 outside Yamhill. Commissioners split two to one over the motion, with Chair Mary Starrett casting the opposing vote. Starrett said she believed that, since the county has previously approved a solar farm in Sheridan by the same company, it had no standing to deny this one. She accused her colleagues of “sending a message to the West Valley” that it matters less than the wine country area around Yamhill. Commissioners Stan Primozich and Rick Olson took issue with her comments, arguing they had concerns about previous applications, and were denying this one for sound reasons. Primozich noted at least one neighbor of the Mill Creek solar farm outside Sheridan testified last week, asking commissioners to deny the Yamhill application. He also said he took full responsibility for failing to advocate for new county rules barring solar farms from being placed on high-value farmland, and pledged to begin working on the issue. He noted the recent proliferation of similar applications worries him. “I think there’s an overall total of 11 solar projects proposed for our county and I just, I don’t think that this has been vetted thoroughly enough. It’s a concern to me, and working with Soil and Water Conservation, they have indicated they have some concerns about the proliferation of these projects and I want to take a step back. And I want to make sure that we have used some sound reasoning in the development of these projects,” Primozich said. He said one of his concerns is soil contamination, although applicants have argued the materials are inert. “Because of the newness, I don’t think anybody can absolutely assure us that sitting out there in the rain and the atmosphere during a course of 10, 15, 20 years, the runoff from those panels and the stanchions and everything else, I don’t see how it cannot have some impact on that soil, making it less suitable to farming at the end of that life. I’m not an agriculture specialist or an analyst, so I can’t tell you that’s the case, but nobody can tell me it’s not the case, either,” Primozich said. Atticus Winery had argued the unsightly installations would harm wine tourism. She also contended the solar farm itself would help preserve farmland, by giving the landowner an income while he tries to keep the land for his grandchildren. The county planning commissioners, who approved the application on a split vote in November, also asked the county commissioners to consider a ban on new solar farms on high-value soils. Planning Director Ken Friday told commissioners last week he hoped to bring a proposal before them in March. Both Friday and Starrett noted until then, applications must be considered under the current regulations. Friday had, however, recommended the planning commission deny the Yamhill application. On Thursday, he did not provide a recommendation for either approval or denial, but rather conditions of approval. Several of those were in response to requests by the applicant to modify some of the conditions approved by the planning commission. The Housing Authority of Yamhill County is seeking a new executive director after longtime director Elise Hui announced her resignation this month, effective June 21. Applications are due by the end of February. Hui, who has headed the agency since 2006, said her husband accepted a job in Florida, and the family will relocate. She worked for the agency for six years before becoming the executive director. The director reports to a five-member board, and oversees programs that include administering federal and state housing policies and programs, managing properties and a range of programs to help people conduct their finances and obtain, or remain in, permanent housing. This month, County Commissioner Mary Starrett asked County Assessor Derrick Wharff to established systems to ensure anyone facing property tax foreclosure in the county is connected to the Housing Authority’s foreclosure avoidance program. Wharff said the county has referred people in the past, and pledged to continue working on the issue. The recent Oregon Department of Human Services Child Welfare audit by Secretary of State Dennis Richardson highlighting the agency’s deficiencies might have come as a shock to the broader community but foster parents, mentors, case workers, and children in state custody, it was an “I told you so” moment. Children housed in hotel rooms and offices, foster parents and case workers fearing retaliation, and inexperienced child welfare workers with impossible caseloads were just some of what the SOS audit found. It wasn’t news to the foster community, but a brutally honest assessment that was years overdue. Foster parents tell me they’re giving up, weary of a “hostile” bureaucracy and the lack of pathways to navigate an inconsistent and complex system. One dedicated child-welfare advocate I worked with spoke out publicly about the need for more foster-parent support. The next day he was asked to resign from the state’s Citizen Review Board position he’d held for a decade. It’s well known within the foster provider community that advocacy comes with a price. At a local foster-parent support group, one parent approached me and whispered “I called DHS to find out if I’d get in trouble if I came here tonight.” That was a chilling indication that the very backbone of our foster care system - our providers - are not only caring for pitifully broken children with often difficult and dangerous behaviors, but they have to do so without the support of the child-welfare agency.. In my efforts to advocate for foster parents and children, I have met with legislators as well as former and current DHS leaders. I’ve formed study groups, advocacy teams and run the gauntlet of red tape for constituents. If I, as an elected official, can’t get straight answers, information, or resolution for the simplest foster-parent concern, how does the average foster parent even begin to get the help they need? 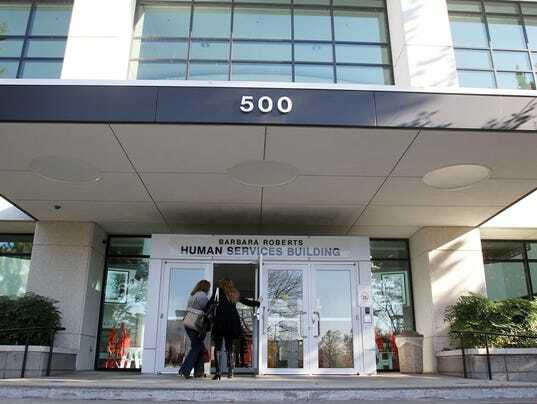 While new DHS director Fariborz Pakseresht and Child Welfare Director Marilyn Jones give me much hope for a turnaround, I’m concerned that by virtue of its size, a large centralized state agency may never do a satisfactory job running the foster care system. Why not let counties give it a try? If counties can administer the state’s Medicaid program through Coordinated Care Organizations, why couldn’t they similarly oversee child welfare? After all, county governments are smaller, more nimble and more responsive to the people. With the political will, a legislative fix could include a pilot project. It’s an intriguing concept that’s worth a try. Mary Starrett is chairwoman of the Yamhill County Board of Commissioners and a foster-child mentor. Reach her atstarrettm@co.yamhill.or.us. It isn’t often we find ourselves aligned with Oregon Right to Life, the Oregon Firearms Federation, Oregonians in Action, the Taxpayer Association of Oregon and other outfits of such pronounced conservative bent. We can ordinarily be found hugging the moderate middle. We are, in fact, opting to join them in endorsing the re-election campaign of Yamhill County Commissioner Mary Starrett. But we are taking that step despite — not because of — a personal political heritage hewing to the far right end of the spectrum, where the Constitution Party holds forth. Starrett may emulate Ayn Rand on hot-button issues on the national level, but she more closely reflects Mother Teresa in her stewardship of health, welfare and social service programs on the county level. She is deeply invested in the county’s foster care, addiction recovery, troubled youth and homeless outreach programs. While she rarely seems to see government as part of the solution nationally, she clearly sees it as part of the answer locally, working in partnership with both faith-based and secular nonprofits to stretch taxpayer dollars further. One of the things she touts on her campaign website is “working with YCAP’s Youth Outreach to bring a drop-in center and youth transition program to include housing, job training, continuing education and support services to McMinnville.” That’s something her liberal-leaning predecessor, McMinnville Habitat for Humanity Director Mary Stern, could embrace with equal enthusiasm. When Starrett challenged Stern in 2010, we were afraid she would eschew nitty gritty work in the trenches for national political posturing, that she was more interested in promoting her ideology providing good government. So we were relieved when she lost. We were no more enamored of her candidacy in 2014, when term limits forced Stern to step down. We called her opponent, public services’ veteran Debra Bridges, “a clear choice” in the race. We also harbored concern post-election when Starrett was awarded the county’s health and human services portfolio. We felt that’s the arena in which her hawkish social issue views might create the most havoc. But she has committed heart and soul to her duties during her four-year tenure. No one on the board has displayed a greater allegiance to hard work, ethical conduct and official transparency. We take strong exception to her Yamhelas Westsider Trail opposition, which we consider ill-founded and overly strident. And we were dismayed when she couldn’t resist signing on, early in her term, to a couple of pointless resolutions embracing her conservative ideology. Overall, though, the former Portland media personality has performed admirably. She has vastly exceeded our expectations. In the process, she has earned our endorsement for re-election. Starrett has drawn two challengers — affable local gadfly David Wall, who is running no discernible campaign, and earnest social issues advocate Chelsey Williams, who is mounting a low-cost grassroots bid. Williams is sincere and well-meaning, but seems seriously outgunned in this race. We feel Starrett turned in the kind of performance that’s earned her another term on the job.